This article reviews our current understanding of the mechanisms of growth failure in chronic renal disease. The neuro-endocrine control of growth hormone secretion and insulin-like growth factor gene expression subject to use of corticosteroids, uremia, and metabolic acidosis are presented. It has been shown in other non-growth hormone deficient conditions such as Turner's syndrome that the use of exogenous growth hormone increases linear growth but also accelerates closure of the growth plate with no significant difference in the final height of such children. An understanding of growth factors is especially important and timely because of the tendency these days to use growth hormone to overcome the growth impairment of children with chronic renal failure. Eleven renal transplant recipients were studied while fasting during the month of Ramadan. All were asymptomatic. The serum and urinary bichemical analysis showed no significant changes. Also, there were no adverse effects on the allograft and the cyclosporine A levels did not change significantly. There was a significant elevation of serum potassium levels during fasting, but the levels always remained within normal limits. Our study indicates that fasting during Ramadan does not seem to be associated with any significant ill effects in renal transplant recipients. However, studies involving larger numbers of patients are needed to confirm this observation. The early changes that occur in the volume and function of the remaining kidney, after uni-nephrectomy for organ donation, were studied in 25 living donors. Serum creatinine (S Cr), creatinine clearance (Cr Cl), renographic clearance tests for total and split renal functions as well as renal volume using ultrasound were determined before and three months after donation. In 76% of the donors, Se Cr showed an increase after kidney donation, but all values were within normal range. The total kidney function in terms of Cr Cl, showed a drop of 36% from the pre-donation value. After three months post donation, the clearance of the remaining kidney increased by 5% to 64% (mean 34%) of the pre-donation values, measured by Tc 99m DTPA renography. Compensatory hypertrophy of the remaining kidney also occurred as evidenced by the ultrasound evaluation which showed an increase in the renal volume by 15%. Our study shows that compensatory changes occur early i.e., within the first three months after uni-nephrectomy. However, prolonged follow-up of these donors is necessary to assess the long­term structural and functional changes in the remaining kidney. Subclavian vein catheterization, the most commonly used temporary vascular access for hemodialysis, is associated with a variety of complications. This retrospective study was done on 96 patients who had 150 percutaneous subclavian vein catheterizations over a one year period using Quinton double lumen polyurethane catheters. A total of 56 complications were seen of which 12 were immediate and 44 delayed. Immediate complications seen were six cases of failure of insertion of catheter and three cases each of subclavian artery puncture and inadvertent entry of the catheter into the jugular vein. Delayed complications seen were infection in 33 cases, thrombosis of subclavian vein in six patients, delayed pneumothorax in four cases and hemothorax in one. One patient, who required repeated catheterizations since he refused creation of AV fistula, died of septicemia. The remaining patients responded well to the treatment of the respective complications. A 25 year old Saudi female, sixth gravida, para four, on renal replacement therapy with regular dialysis for nearly two years, was diagnosed to be pregnant at 12 weeks, with a single viable fetus. She was managed with increased frequency of dialysis and increased doses of anti-hypertensive drugs. For the control of anemia, which was further worsened by the pregnancy, she was treated with r-HuEPO 125 to 150 u/kg 3 times/week along with iron and vitamin supplements to maintain hemoglobin of 90 gm/L. The pregnancy continued to 36 weeks and she had a spontaneous normal delivery of a male baby without any congenital defects, weighing 1605 grams with Apgar score of four at one minute and nine at five minutes. The reported incidence of end-stage renal disease (ESRD) in Kuwait is 72 patients per million population per year. All modalities of dialysis therapy are available and are offered free of cost. There are 232 patients of whom 166 are on hemodialysis, five on hemofiltration, 45 on intermittent peritoneal dialysis and 16 on continuous ambulatory peritoneal dialysis. 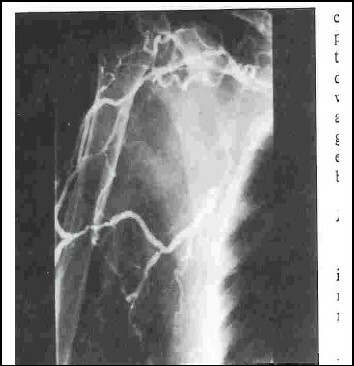 Chronic tubulo-interstitial disease resulting from atrophic pyelonephritis was the leading cause of ESRD in these patients. Nearly half of the patients on dialysis receive recombinant human erythropoietin. 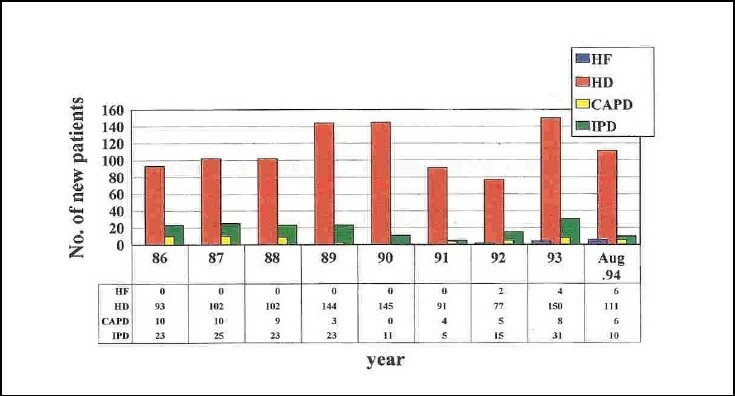 From 1979 until March 1990, 500 renal transplantations were performed in Kuwait of which 350 were performed using kidneys from live related donors, 100 from cadaveric donors, 50 from live unrelated, but emotionally related, donors. The limited pool of potential kidney donors continues to be a major problem. Our experience with imported cadaver kidneys showed that they were unsafe. Commercial kidney transplantation, in our experience, was associated with high morbidity and mortality rates. Despite the governmental laws, religious approval, and adequacy of transplantation facilities in Kuwait, the progress in the field of local organ procurement has remained very slow.